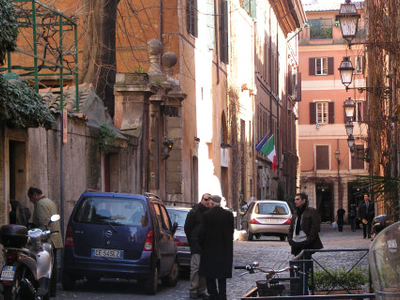 After the film Roman Holiday became popular, Via Margutta developed into an exclusive neighborhood, where various famous people lived, such as film director Federico Fellini. From the north the area can be reached from Via Cassia or Flaminia, passing then through Piazzale Flaminio, and through the city door in the wall that leads to Piazza del Popolo. From this point one walks several metres to the left of Flaminio Obelisk towards Via del Babuino, and on the left there is an alley that leads to Via Margutta. From Piazza di Spagna, one can take via del Babbuino, turn right on via Albert, and via Margutta will be on the left. Among the historical inhabitants of the street were Giulietta Masina, Federico Fellini, Renato Guttuso, Marina Punturieri. In the same area can be found the "Fontana delle Arti", which has a triangular base, crowned by a bucket of paint-brushes (symbolizing the presence of artists in the area dating from the 17th century). According to the project architect, Pietro Lombardi, who also designed other small "fontanelle" throughout Rome (usually inspired by the coats of arms of the ancient Roman quarter (rione), the marble fountain was carved in 1927. Two masks are on opposite sides, mounted over marble supports. The images are of the now familiar sad and happy faces, symbolizing the fluctuating moods typical of artists. The two carved faces pour their weak water streams into two small bathtubs. 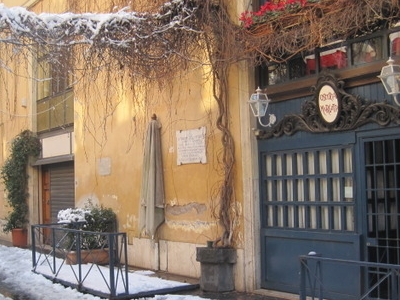 Here's the our members favorite photos of "Famous Streets in Rome". Upload your photo of Via Margutta!